Quinton Hypertonic is a natural nutritional supplement based how sea water contains the same minerals as our blood. It is made from pure, mineral-rich sea water that is harvested from a pristine plankton bloom in an internationally protected part of the Atlantic Ocean. 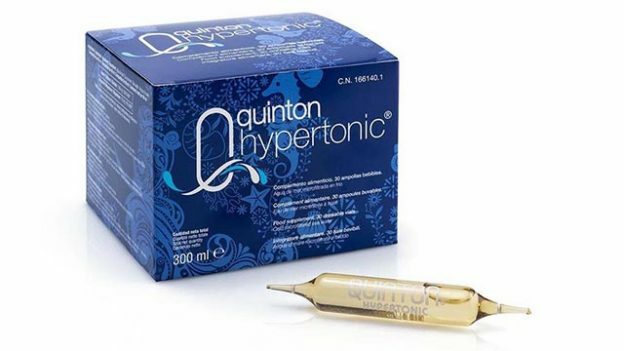 Quinton Hypertonic contains all the minerals, trace elements and micronutrients that your cells require in organic, bioavailable form. It delivers them at three times the mineral concentration of your blood and extra-cellular fluid. Quinton Hypertonic is manufactured by Cell Nutrition, based in Galway here in Ireland. It provides your body with a rapid re-mineralisation that people find very energising. It is the ideal support before, during and after any type of physical exercise. Others can use it too, for a feeling of general all-round wellness. Without preservatives, without sweeteners, without sugars. This product is to be used as part of a balanced and varied diet and a healthy lifestyle. Maximum daily intake: 6 vials. ND = element present, but impossible to establish exact amount as quantities are so small. To learn more about Cell Nutrition Quinton Hypertonic, and to try it for yourself, just call to see us Evolv. We’re open at 2 Castle Hill, Enniscorthy, Co. Wexford, from 9.30 a.m. to 6 p.m., Monday to Saturday.